For Premier League clubs, the FA Cup third round signals the annual start of their bid for glory. It has, though, been known to mean so much more than that. The third round has witnessed the turning point for at least two legendary managers, as well as the decline of a once great club and the resurgence of another. Here, BBC Sport looks at some third-round ties whose influence stretched far beyond progression to the next stage. Did fans' team-talk keep Kendall at Everton? With two league titles, an FA Cup and a European Cup Winners' Cup, Howard Kendall oversaw the most successful period in Everton's history. However, had a result in an FA Cup third-round game at Stoke City in 1984 turned out differently, it might never have happened at all. Kendall, in his third year as Everton boss, appeared to be on borrowed time as another campaign threatened to end without success. Prior to the trip to Stoke, the Toffees were 16th in the old First Division and had drawn 0-0 at home to Coventry. They then scraped past Chesterfield 3-2 on aggregate in the League Cup. The fans were becoming frustrated. Just 8,067 turned up at Goodison Park to watch the Chesterfield tie, where leaflets were handed out by supporters making their feelings known about Kendall. "Kendall and Carter Out - 30,000 stay at home fans can't be wrong. Bring back attractive, winning football to Goodison Park," they read. He needed a win, and it came at Stoke as goals from Andy Gray and Alan Irvine sealed a 2-0 victory. "Many Everton fans happened to be standing and singing on the road outside the Toffees' dressing room as Kendall prepared to address his players before the game," says BBC Sport chief football writer Phil McNulty, a journalist at the Liverpool Daily Post at the time. "Kendall later revealed he simply opened the dressing room window to let his players listen to the chants of hordes of fans and said 'there's your team talk - don't let those fans down'." A win against Oxford United in the Milk Cup followed and the pressure eased on Kendall, who went on to lead Everton to FA Cup triumph that year. 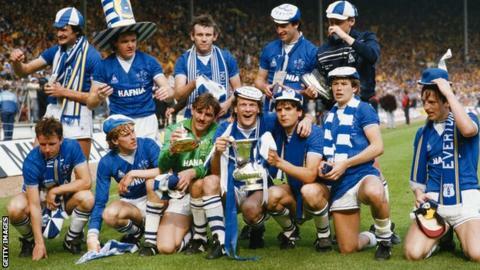 The Toffees secured a league and European Cup Winners' Cup double the next season, and another domestic title was won in 1986-87 - their last league title. No-one would have predicted that such success would follow what had been a rocky start to Kendall's managerial career at Everton. No-one, it seems, except for Kendall himself. "Howard was convinced early on," remembers Kevin Ratcliffe, Everton's captain under Kendall. "I remember he said to me after one game, 'you do know what year it is, don't you? It is the Chinese year of the Rat. We are going to win the cup'." While that FA Cup tie helped keep Kendall at Everton, another might well have seen him appointed to one of the most coveted managerial positions in football. In January 1990, with Manchester United struggling in the league without a trophy in three years under Sir Alex Ferguson, the pressure was mounting on the Red Devils boss. The FA Cup was United's only chance of silverware and, if the newspapers at the time were to be believed, defeat by high-flying Nottingham Forest in the third round would have spelled the end of Ferguson at Old Trafford, with Kendall believed to have been considered as a potential replacement. Defeat, though, never materialised, as a solitary Mark Robins goal ensured victory. Four months later, United lifted the FA Cup. So did Robins save Ferguson from the sack? "Sir Alex wrote a book and, in it, he was asked the question 'did the goal save his job? '," Robins said in 2009. "He wrote that in training I would have missed it - but because I got a push in the back from Stuart Pearce it went in! So did I save his job? Yes, I did." "We will start and end our FA Cup run in Cardiff," David O'Leary proudly proclaimed when he was manager of Leeds in 2002. They did indeed do just that, although not the way O'Leary had anticipated. The Irishman's comments came ahead of a third-round match at Cardiff, and with the FA Cup final being held at the Millennium Stadium in the Welsh capital, it was clear O'Leary fancied his side to win the competition. Instead, Leeds - Champions League semi-finalists the previous year and top of the Premier League at the time - suffered a shock early exit. Cardiff, then a third-tier side, beat Leeds 2-1. O'Leary's team, perhaps stunned by the upset, failed to win any of their next nine games, losing to PSV Eindhoven in the Uefa Cup and finishing fifth in the Premier League, thus missing out on Champions League qualification for the second successive season. The club had not banked on failing to make Europe's elite competition two years in a row and as a result the squad was rapidly dismantled. Star players such as Rio Ferdinand were sold as the club's budget was cut, and relegation to the Championship followed in 2004. This season marks their 11th out of the Premier League. Wintry weather causing havoc with the fixture list in British football is not uncommon, but the effect that the Big Freeze - one of the coldest winters on record - had on the 1963 FA Cup third round schedule will take some beating. Heavy snow, freezing fog and temperatures as low as -20C meant that a round that began on 5 January that year did not end until 11 March - 66 days, and 261 postponements, later. Fourth Division side Lincoln's match against Coventry was the most hit by the conditions, having to be rescheduled 15 times. "The ice underneath and the snow on top made it absolutely unplayable," recalled Norman Saywell, a former referee who inspected the Sincil Bank pitch on seven occasions. "It dragged on and on. You couldn't play, simple as that." Norwich, in an effort to get their cup tie with Blackpool played, attempted to thaw out their pitch with flamethrowers. At Stamford Bridge, hot tar was used while some teams just gave up trying to get games played altogether - Halifax turned their Shay stadium pitch into an ice rink. The football pools - a betting system based on predicting the outcome of football matches - was particularly affected by the near-empty fixture schedule and to combat the financial loss the Pools Panel was created. The panel, which back then consisted of six men including former England players Sir Tom Finney and Tommy Lawton, met to deliberate how they thought the games would have gone, with the results announced on BBC television. The FA Cup. The oldest domestic cup competition in the world and arguably the most prestigious. That status took a hit in 1999 when Manchester United, the FA Cup holders, pulled out of the competition to compete at the Club World Cup. Under pressure from the Football Association and the government to boost England's doomed bid to host the 2006 World Cup, Sir Alex Ferguson's side were encouraged to take part in Fifa's new showpiece club event in Brazil. "I understand the meaning of the FA Cup now but I had only come to England a few weeks before so back then I did not know what I was missing," said former United defender Mikael Silvestre. "It was only the year after that I realised we had not been part of this massive cup. But the FA Cup is played every year so it was the right choice to miss it that year." Not everyone agreed. Many saw the absence of the holders from the world's oldest knockout tournament as a national scandal. David Mellor, chairman of the National Football Taskforce at the time, said he was "personally very strongly opposed" to the move. The then BBC radio presenter and Tory MP said: "I do understand the pressure of 2006, but I don't see why domestic competitions - particularly the most prestigious domestic cup competition in the world - should be downgraded so United can participate in what we would otherwise regard as a Mickey Mouse tournament." No club has done anything similar since. Despite the bad press from a decision which Ferguson later described as "without doubt a catastrophe", United didn't have a bad season in the end, winning the Premier League title at a canter. The start of the Shankly era? It was one of the greatest third-round shocks and arguably the biggest upset Liverpool have been on the wrong end of in the FA Cup, but it may ultimately have been the catalyst for a period of great success for the Reds. Knocked out of the competition by non-league Worcester in 1959, the result marked the beginning of the end for then manager Phil Taylor. Liverpool may have been a Second Division side at the time but they were desperate to return to the top flight. After failing to achieve that in 1959, Taylor departed and was replaced by the legendary Bill Shankly from Huddersfield Town. "I just about remember the game and Liverpool were humiliated," said BBC commentator John Motson. "Very few people had heard of Worcester City and that result was a bit of an earth shaker. "Liverpool were on a downer and I think it was then that the directors thought to go to Bill Shankly and went to him to rebuild the club." Rebuild he did as promotion back to the top flight came in 1962 and a great period of success followed as Shankly led Liverpool to three First Division titles, two FA Cups and one Uefa Cup.